The plight of little children has been headline news in the United States recently. Following illegal entry into this country, immigrant families are being separated upon apprehension. Children are taken away from parents and cared for in a different location causing trauma for all involved. According to the U.S. Department of Health and Human Services, as of October 20, 2017, 430,000 children and youth were in foster care. Sadly, a similar story is played out regularly here in the U.S. with American citizens. Governmental authorities must remove children from parents who are deemed to be neglectful or abusive, and the children are taken and placed in foster care. Young children do not comprehend the operation of the legal system; thus, removal from a parent, even a poor one, is a traumatic occurrence. According to the U.S. Department of Health and Human Services, as of October 20, 2017, 430,000 children and youth were in foster care. That’s a huge number of hurting children. A favorite childhood song tells us that “Jesus Loves The Little Children” regardless of their color; He just loves children period. It is irrelevant to Him whether a child is in foster care. He simply wants, as He directed in Matthew 19:14, to have little children come to Him. And how do the little children get to Him? Well, they need our help. Not all of us can be on the front lines by serving as foster parents and demonstrating Jesus’ love directly to a child. But there are still ways that everyone can assist in showing God’s love to a foster child and help Him come to Jesus. The foster and adoptive parents support team at Crosspoint Church in Niceville, Florida is aware that kids are a priority to Jesus. Team members take Jesus seriously and put His love into action through this ministry. They recognize that, while not everyone can be a hands on care provider, everyone has the capability of pitching in to support foster caregivers and their precious charges. The support team is quite diverse—teenagers, single moms, older adults, etc., but the team is comprised of members with one common denominator—a desire to show God’s love by helping kids in need. The support team is an outgrowth of Crosspoint’s annual Orphan Weekend services each October where the needs of vulnerable children in the community and around the world are highlighted. After putting on this event for several years, Crosspoint began getting feedback from people who really wanted to be a part of the foster care/adoption community but who could not open their homes to provide care. Brainstorming ideas followed, ultimately leading to the creation of the foster care/adoption support team. Leading the support team are Crosspoint’s missions pastor, Tyler Fuller, and his wife, Leslie. The couple is passionate about adoption and foster care having firsthand experience with both. The Fullers have adopted three children through the foster care system with a fourth child’s adoption finalization set in September. Crosspoint’s foster/adoptive parent support team’s activities do not require face to face meetings. Members are linked online where they can be notified of current needs. Throughout the year the team collects frozen meals which can be delivered to foster families when they take placement of a foster child; the foster family thus has more time to focus on the child when kitchen duties are lessened. It is one thing to bemoan the plight of poor children who have been separated from their parents. It is something else entirely to do something about the situation. Ten dollar Wal-Mart gift cards are also gathered to be given at the time of a new placement. While government stipends are available to foster parents, there is typically several weeks delay for these funds to be received. Gift cards allow immediate material needs to be covered following a placement. Foster and Adoptive Family Fun Days are also hosted by the team. 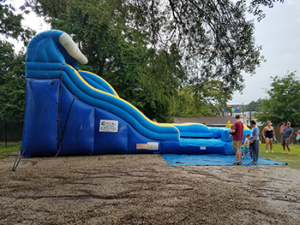 These events allow a no cost opportunity for families to enjoy time together and to connect with other families in similar situations. Supportive relationships are built with others facing the same types of challenges and issues. Practical assistance is also given by the support team. Yard work and clean up services have been provided. Bunk beds have been built and rooms have been painted for foster families. The time commitment for a team member is within that team member’s control. Help can be as simple as buying a gift card when one is out doing his own shopping. It can involve several hours of time if one volunteers to help with building or cleanup projects. Helping can even be fun such as passing out pizza or sno cones at a family fun day event. It is one thing to bemoan the plight of poor children who have been separated from their parents. It is something else entirely to do something about the situation. Those who truly care about these children want to help and show Jesus’ love to them. Participation in a ministry like Crosspoint’s foster and adoptive parent support team is a concrete and simple way to live and look like Jesus. Love the little children today by getting involved in activities which help and encourage foster children and their caregivers.